Acrylic on Canvas, 30" X 30", $900. Still Available. 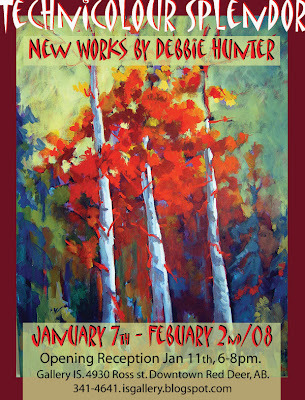 For this show we are offering a chance to purchase a Debbie Hunter original before the show opens on Jan 7, 2008. The Pre-Sale items were chosen by Gallery IS and will be available for viewing at the Gallery- you will need to ask as the artwork is under lock and key until the show is hung. Only the two art pieces shown here are available for the Pre-Sale. Please contact Erika or Jeri-Lynn if you are interested in purchasing one or both of these Pre-Sale items at Gallery IS- 4930 Ross Street, 403-341-4641 or email at galleryis.arts@yahoo.ca. Pre-Sale closes Jan 4, 2008. Debbie Hunter's show promises to be full of her very unique and vibrant use of colour and design. 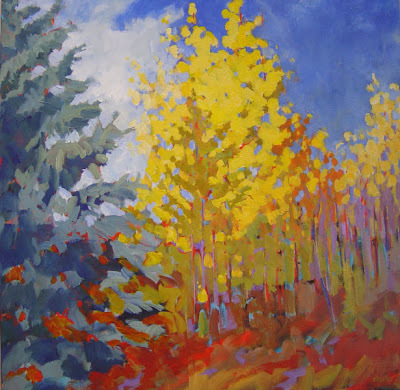 This past year Debbie won the master class of the Central Zone Show at the ACACA and also the Sterling Award at the Alberta Wide ACACA show at the Red Deer and District Museum. She is also a recipient of the Lillian Nunn Scholarship. 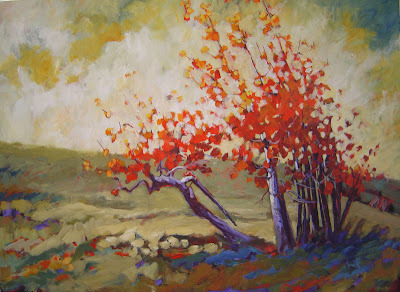 Gallery IS patrons will have the chance to be a part of this award winning artist's First Solo Show this January. Debbie Hunter is currently working and living in Stettler AB and is originally from Red Deer Alberta.